Last week, we asked bloggers to write about their 'Conversation With God' for our WOW initiative. We told them that if they had a new communication line opening up and the person opposite would be God, blog about the nature of the conversation you would have. We loved the entries that came in! Thank you so much for your response. We could not include the entry by AuraOfThoughts since this was a dated one. 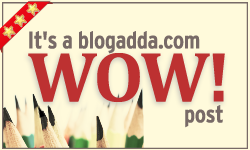 To be a part of WOW, ps write new entries or republish them in the current date in accordance with the prompt.